Are they looking for a PC or a Mac? Are they looking for a desktop or a laptop? Are they just browsing or buying? For broad keywords like this, it is often good to point them to a top-level hub page, with a range of choices and call-to-actions spanning learn, buy and use. Sometimes though, people use trigger words to narrow their search. Trigger words are words added to a keyword that better qualifies what it is exactly they are looking for. 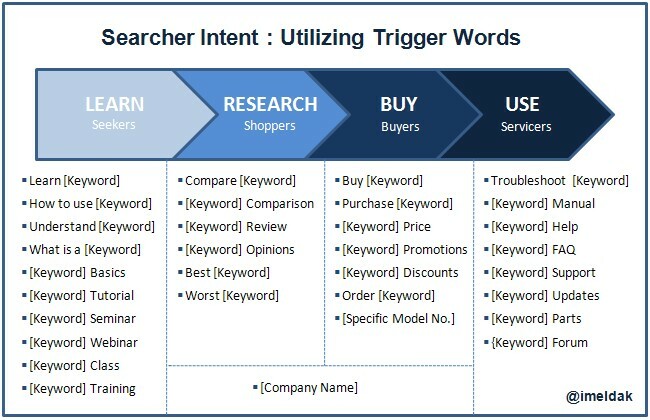 Trigger words are magic as they provide an insight into searcher intent. When we know the intent of the searcher, we can organize our PPC adgroups in a way that better appeals to their needs, through relevant ad copy and more targeted landing pages. Seekers are in the learn phase of the buy cycle. They seek out basic information and learn about the different solutions that are available to a problem they are facing. With seekers, you better make sure that your site contains good, educational content to cater for this type of searcher. The thing to remember about seekers, is that it’s not all about the hard sell. Shoppers have a better idea as to what they are looking for. They are looking to compare different solutions, specifications and prices to get the best deal. Buyers are looking to enter into a transaction. At this point, they have pinpointed exactly what they want, and are looking to get quotes, buy online or find a physical location where they can buy. Servicers are existing customers who have already bought a product and are looking for customer support, replacement parts, and product help. In addition to external search engines, servicers often conduct on-site searches on your website.